Elective Abortion Services Cut By Maine Insurance Co-Op : Shots - Health News Community Health Options is dropping elective abortion coverage in 2017. The insurer says the move will save money. Advocates for abortion rights say it's a step backward for women's health. 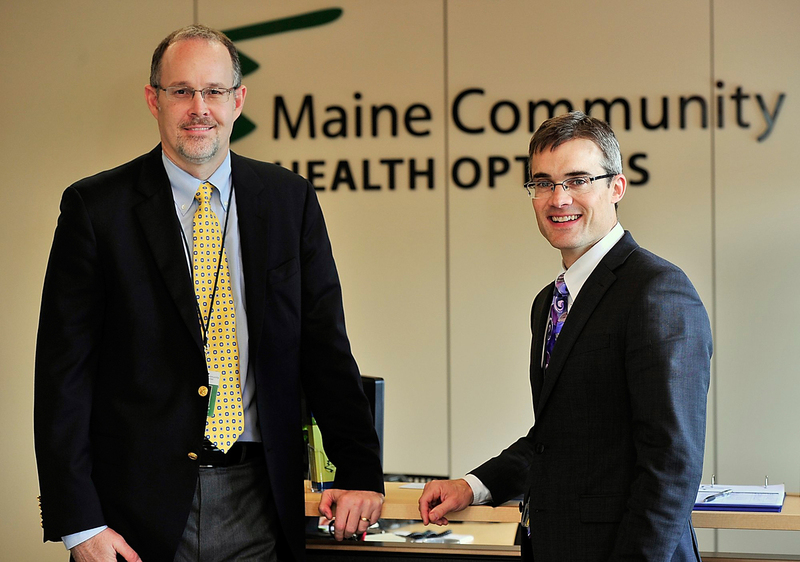 Community Health Options founders COO Robert Hillman (left) and CEO Kevin Lewis seen in 2013 when the co-op began offering coverage. The largest provider of health coverage on the Affordable Care Act's online marketplace in Maine has dropped coverage of elective abortion services. "This decision was really driven by economic considerations," says CEO Kevin Lewis, "as well as the construction of the Affordable Care Act and how it regards essential health benefits in the individual marketplace." Elective abortions aren't considered an essential health benefit under the federal health care law. Neither is adult vision care, which Community Health Options also dropped. Both services were included in all of the 56,291 policies the co-op sold on the individual market in 2015. Lewis says he can't pinpoint exactly how much the co-op will save, but eliminating elective abortion coverage is one of several changes the co-op made to rein in an already steep premium hike of 25 percent. Without the changes, Lewis says, the average increase would have been 33 percent. While Community Health Options describes the change in abortion coverage as one piece of an overall strategy to contain costs, abortion services providers in Maine are calling it a major decision that erects barriers to women's health care. "It further stigmatizes a normal procedure that we're trying to help people understand is part of the comprehensive experience of women's health care," says Andrea Irwin, executive director of the Mabel Wadsworth Health Center in Bangor, one of three main providers of abortion services in the state. Though Community Health Options says it provides coverage for birth control above and beyond the requirements of the Affordable Care Act, Irwin says sometimes birth control doesn't work and women need another option. Most people buying insurance in the online marketplace "are by definition working people with low to moderate income who need help buying health coverage," she says. A spokeswoman for Planned Parenthood of Northern New England, Nicole Clegg, says she appreciates the financial issues Community Health Options is facing but is skeptical that cutting coverage of abortion services will do much to help buoy the co-op. The cost for a first trimester abortion is about $550, she says. Community Health Options says 33 women in Maine used their elective abortion coverage in 2015. Clegg says Community Health Option's decision can't be viewed in isolation. "You kind of need to look at the larger strategies that have been deployed by Congress, by legislators, to restrict access to safe and legal abortions," she says. "And one of the tools that they use is to make it harder for insurance to cover it." Abortion is the only service under the Affordable Care Act that is explicitly allowed to be banned, says senior policy analyst Laurie Sobel of the Kaiser Family Foundation. Twenty-five states ban it, she says, and "six of the remaining states that have no ban on abortion coverage did not have any plans that offered coverage in 2016." For plans that do provide coverage, there is administrative complexity. Funds for abortion services must be segregated, and insurance companies are subject to extra reporting and audit requirements. Even though the state of Maine doesn't ban marketplace coverage, Sobel says Community Health Options' decision is "a reflection of abortion coverage being extremely restricted in the country as a whole."